When it comes to knowing the small towns of Tuscany, I think I’ve seen pretty much all of them. But neighbouring Umbria, I know barely at all. 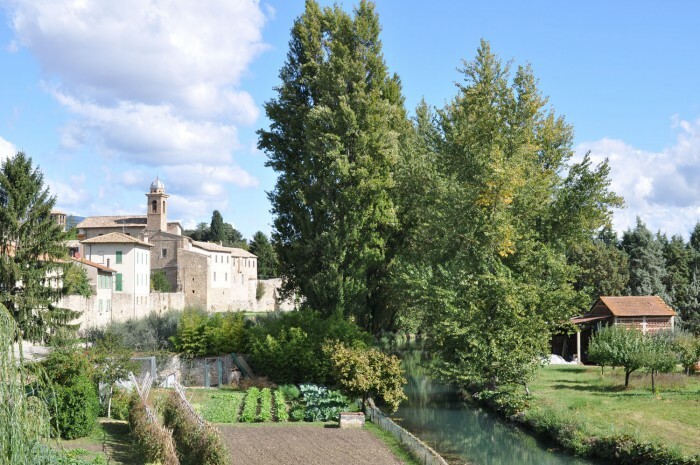 I’ve visited Perugia, Assisi and maybe Gubbio, but I’ve never spent very long in the “green region” trying to figure out what makes this area special. 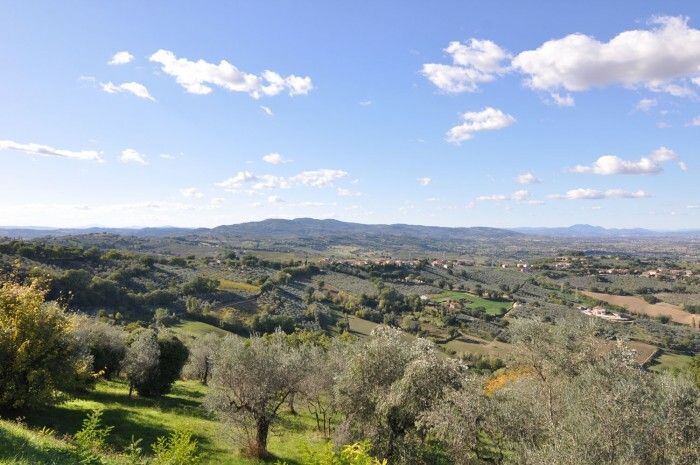 Given a long weekend with my parents and not much time to get organized, I contacted Rob of Special Umbria, a property management company, who has made a quiet corner of Umbria his home. 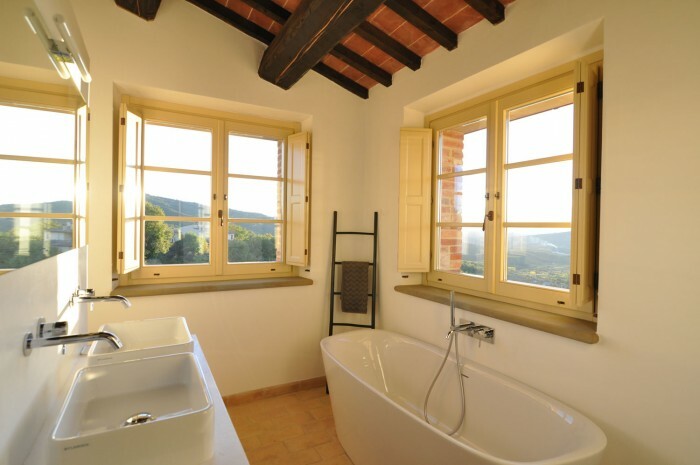 I had written before about the decorating panache of Rob Landeweerd and Jeroen Macco, two Dutchmen who fell in love with Città della Pieve and purchased a home near a town a few kilometers away (near a very small town called Piegaro), which blossomed into a business renovating villas for other people. Remembering how beautiful their villas are, I thought “what better place for a home base to explore some of the smallest towns of Umbria!”. Plus I figured Rob’s tips would lead me to discover why those who come here never want to leave. Umbria’s a rather large region that borders on Tuscany, Lazio and Le Marche. The A1 highway runs down its west side, while the superstrada from Betolle towards Perugia cuts through its upper half. The rest is a network of small roads for small towns that require a fair amount of meandering to visit. 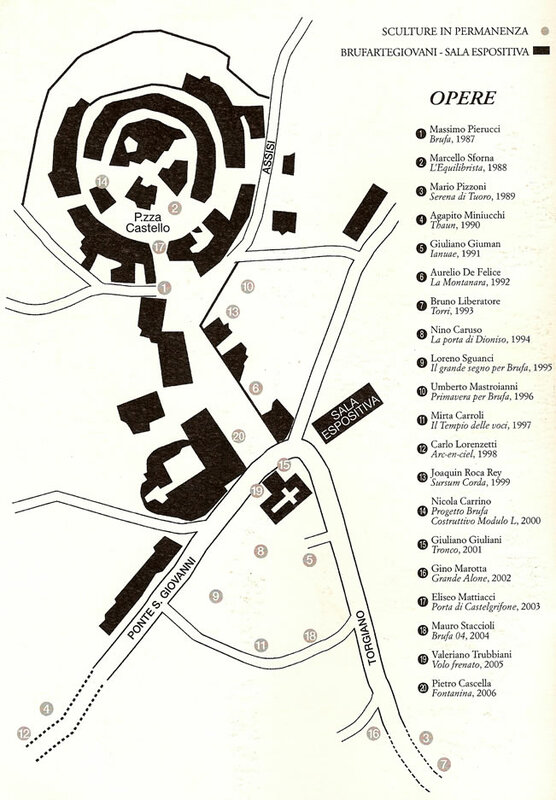 Perhaps the most forgotten corner of Umbria is just south of Lago Trasimeno; our home base was near (not even in!) the town of Piegaro, known, if at all, for its glass factory (old and new), which really is about an hour’s drive to anything. Once we arrived at the villa (see photos below) we didn’t want to leave; had I not wanted to write an article about what to see here, we risked just hanging out and looking at the view for three days. Instead, I dragged the family out to explore a few things within an hour’s range. 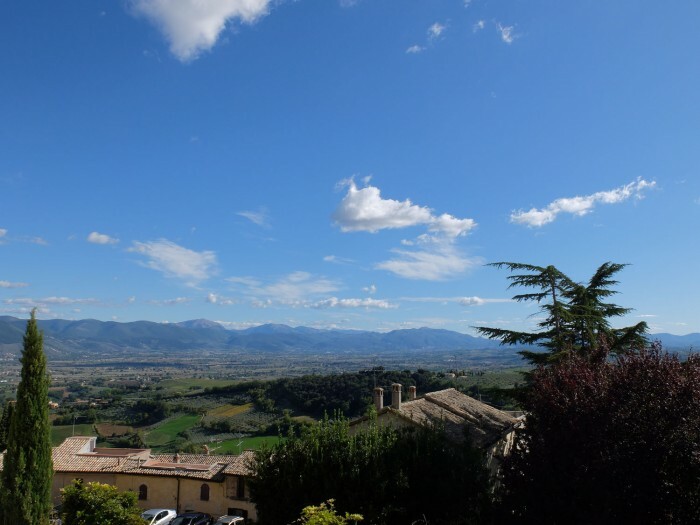 Small town Umbria is the perfect destination for the true Italy lover who has seen and loved the big stuff and now wants to sit back and live the good life: a bottle of wine, some sausages and a sunset with green hills as far as the eye can see. I’d heard about Bevagna because it is a “bandiera arancione” town, an award given by the Italian Touring Club to the very cutest towns with a series of regulations (they can’t be on the coast, they must have fewer than 15k residents and must be organized to welcome tourism). The walled, medieval town of Bevagna (population 5000) indeed fits the bill. It is recognized for its lovely piazza Silvestri, which actually has not one (as would be normal) but two churches on it as well as a city hall and a 19th-century theatre. Of the history you can’t see, Bevagna was actually established as a Roman town in 90 AC, called Mevagna, and there are traces of a Roman temple and the footprints of its forum visible. Beyond the piazza, another high point is the river Clituno that runs along one side of town, which was subject to a later urban intervention to build a bridge and piazza over a small dam. There’s a very pretty view over this river, and a cycling path that connects Bevagna to a number of other towns in Umbria. In addition, there’s any number of attractive small streets in the pedestrian center that are just charming. 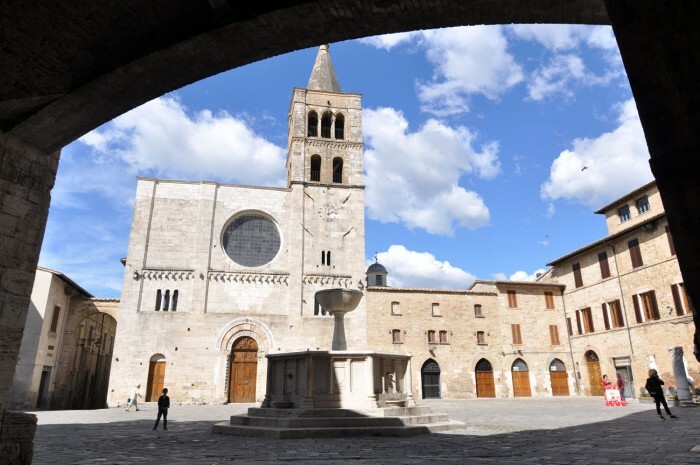 Just 12 minutes away from Bevagna (so best done as a day trip together) is Montefalco, a town who gives its name to the wine region that makes Sagrantino di Montefalco – a good heavy red. Believe it or not, I actually first heard about Montefalco thanks to a project quite a few years back in which Arnaldo Caprai, winery as well as textile manufacturer, was supporting the acquisition of a document that was the original contract between a church here and the artist Benozzo Gozzoli to paint it. That was 2013; the textile group also funded the restoration of this chapel last year. 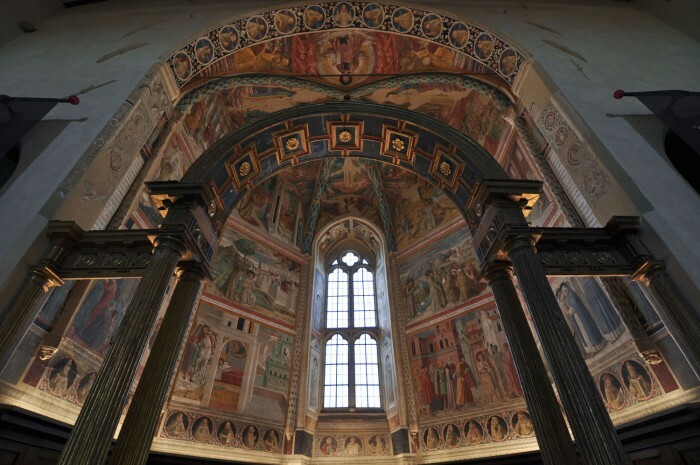 Now part of the museum complex of San Francesco, it’s possible to visit this little gem of a high chapel that is entirely frescoed with three levels of scenes from the life of San Francesco. 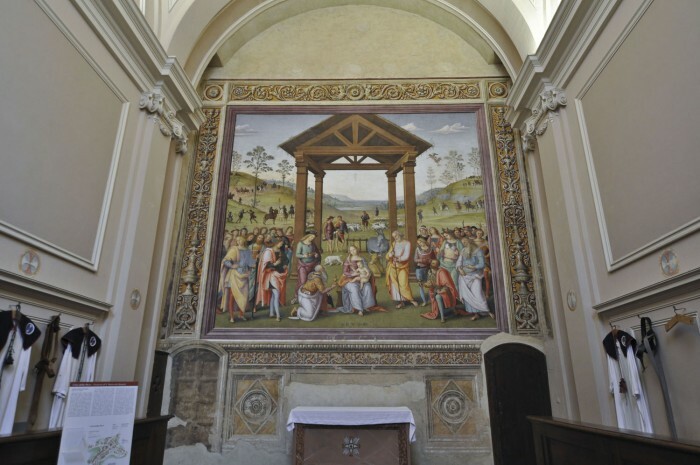 The commission was in 1452, 7 years before Benozzo frescoed the Medici Chapel in Florence. Also in the same church there is a fresco by Perugino on the counterfacade, of the holy family in adoration… this curved wall lends itself terribly well to selfies, though I will not show you the somewhat blasphemous one I took :). 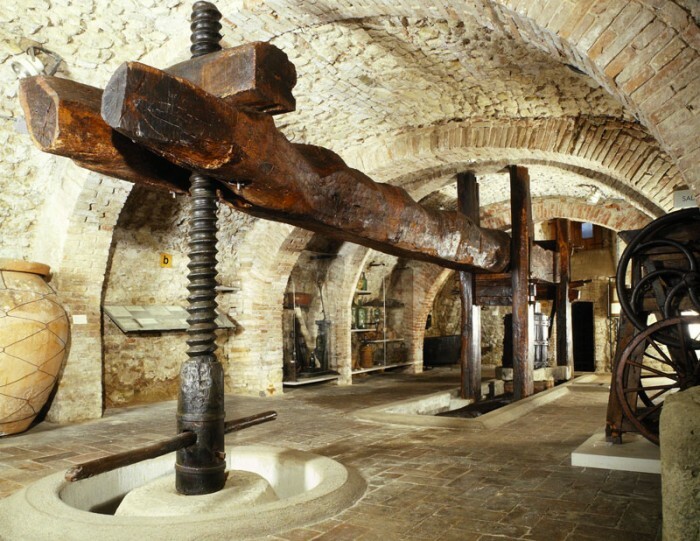 A small pincoteca and a display of ancient wine making tools in what was once the monks’ cellar completes the visit of this complex. Montefalco is nicknamed “the balcony of Umbria” for good reason – the town vaunts a 360 degree panorama from which you can easily see Perugia, Assisi, Spello, Foligno, Trevi, Spoleto and Bevagna, as well as the Apennine mountains and Monte Subasio (where San Francesco built a hermitage). Interesting fact, the town was previously named Coccorone, maybe from its circular medieval walls or the crown around its main tower; the falco (falcon) name likely comes from when the Emperor Fredrick II of Swabia visited in 1240. Like in most of Umbria, you certainly should come here for a good meal. We had a great one at Locanda del Teatro, upscale dining and great wine selection run by true food lovers. In the summer they have an amazing balcony out back from which to take in the views (reservation recommended). Torgiano is a town I’ve always associated with wine thanks to the wine museum here, which was sponsored by the important winery Lungarotti. MUVIT was created by the Lungarotti family in 1974 and presents 5000 years of history organized through various themes, from objects and depictions of wine in the ancient world, to more modern ceramics used for “drinking games”, to images of dionesian fun through the ages. There are also interesting contemporary graphics and ceramics. 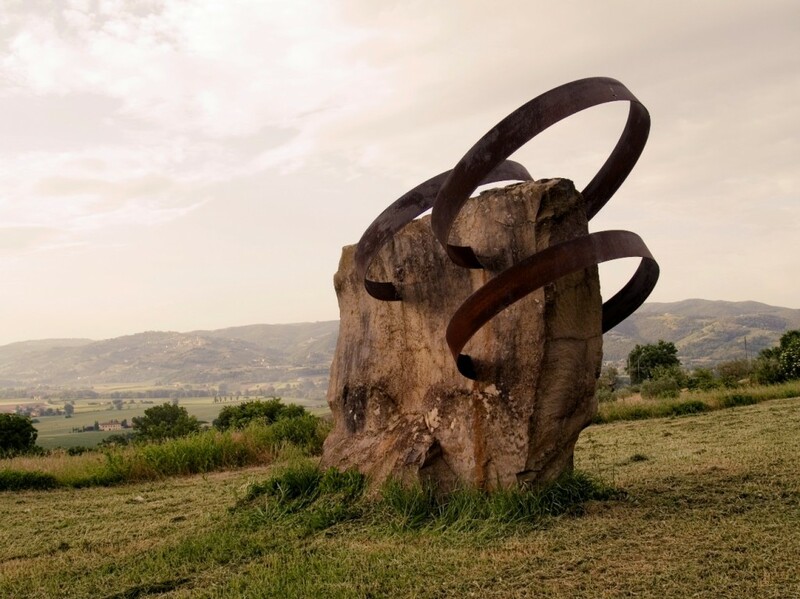 In the countryside just outside of Torgiano, keep your eyes open for seemingly random sculptures. These are part of a project called Scultori a Brufa, which placed one work in the landscape each year from 1987 to 2011 (or maybe later – I’m not sure if they abandoned the project or just stopped updating the website). Anyway, here is a map to find the sculptures in and around Brufa. Continuing south from Torgiano is Deruta, a town that is historically as well as currently associated with ceramics. Hence, the top thing to do here is to visit the ceramics museum, or to purchase ceramics for your home (they do amazing big tables you can have shipped home). I’ve always been oddly into ceramics – I love the little room dedicated to them in the Bargello, and have visited ceramics museums in Montelupo Fiorentino and Faenza (which is amazing). 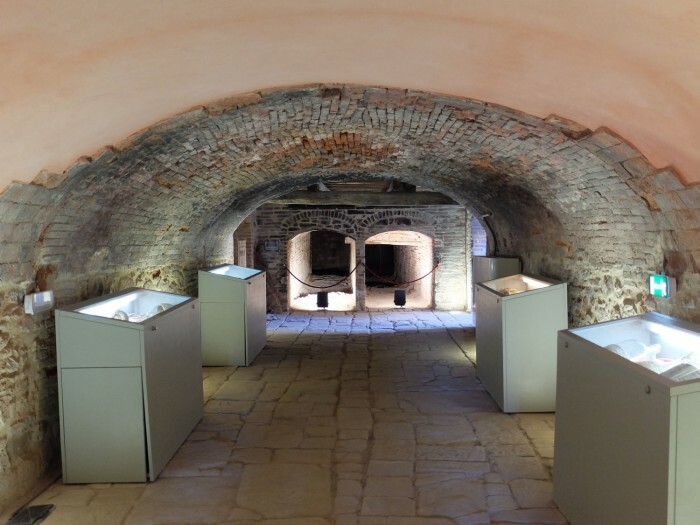 The ceramics museum of Deruta is one of the most complete, with a whole history of ceramic decoration through the ages (in Italy) and a most amazing archive four floors deep that you can consult at any time! Deruta was famous in the Renaissance for some of the most decorative painted plates, so here it’s interesting to look at how various themes get repeated over centuries. This was actually a topic in my PhD dissertation which was about putti (those fat babies you often see dancing around) – they tend to show up a lot in maiolica decoration, hence the number of these museums that I have visited! One of the most charming towns this side of Umbria (and the one that fully charmed my hosts Rob and Jeroen) is Città della Pieve, the native town of the artist Pietro Vannucci, much better known as Perugino. Like Bevagna, it’s a Bandiera Arancione town, and it truly deserves it. Other than its natural adorableness, they have done an excellent job of creating signage, corroborated by an app with QR codes and free wifi. 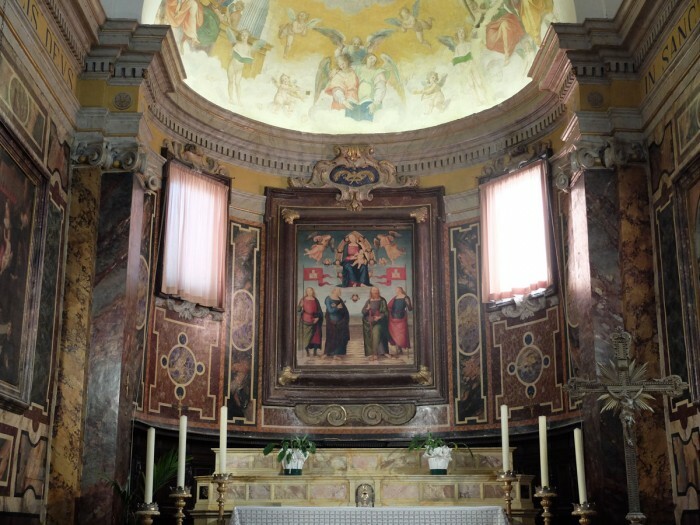 If you love art as much as I do, you’ll want to visit the three works the artist has left there: “The Adoration of the Magi” in the Oratory of Santa Maria dei Bianchi, “The Baptism of Christ” in the Cathedral, “The Descent from the Cross” in the Diocesan Museum of Santa Maria dei Servi. If you’re staying in the area, you’ll easily recognize how the artist’s famous jewel-toned landscapes are taken from the Val di Chiana and the Lake Trasimeno area. The Adoration in the Oratory was painted for a confraternity that was founded in the 13th century and is still active today, counting some 40 people. The man who welcomes you (and collects the 2 euro admission fee) is a member, and will tell you the whole history of the fresco, which Perugino painted in 1504. I love this story of the typical Italian value for creativity and bill-paying. 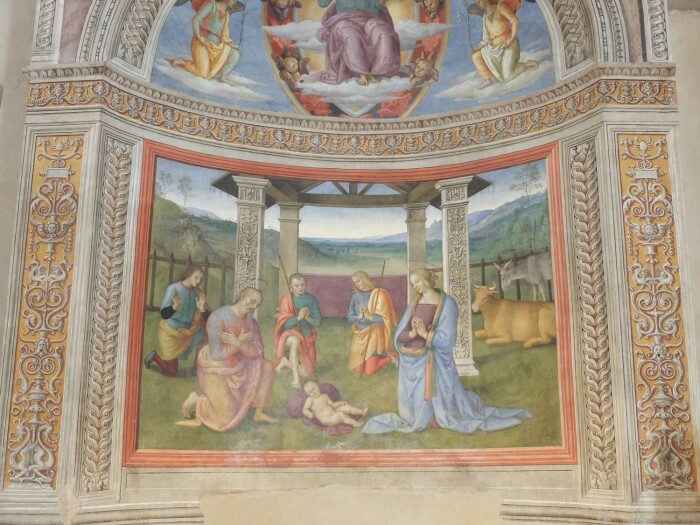 At this point, the artist was already quite famous, having worked in Rome and Florence, but the contraternity’s prior was his father, so he felt like he had to do it (my interpretation here). 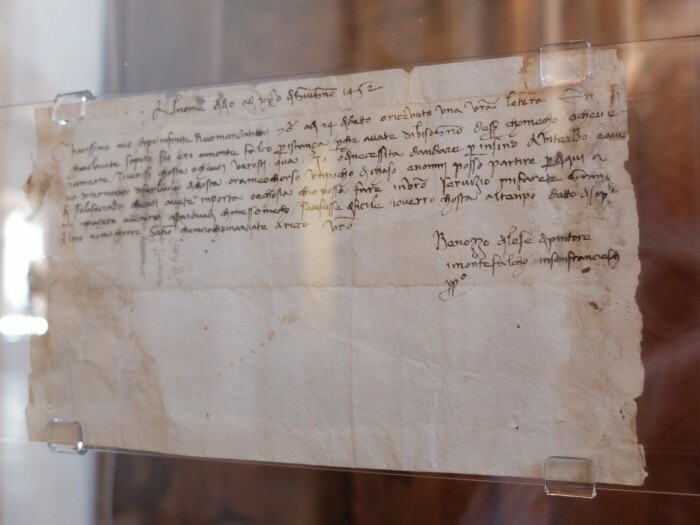 He originally asked for 300 florins, but in the end accepted 25 florins, a house and a mule! He did another painting in nearby Panicale, and never got paid at all. So, better a mule than nothing? Sick of Perugino? 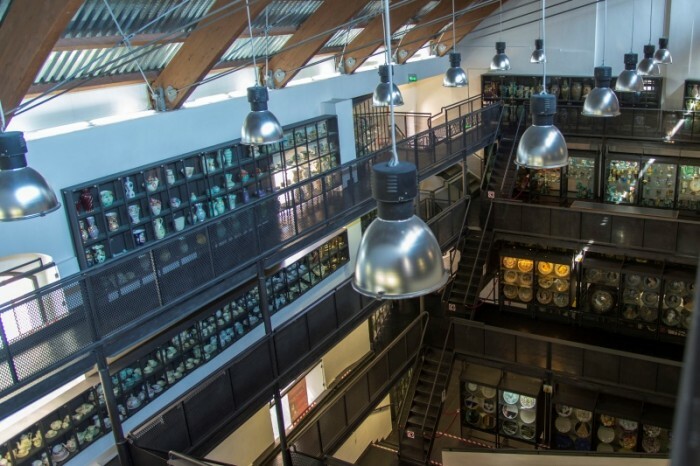 Visit the Lauro Collection of contemporary art, in a post-industrial warehouse: a private collection of over 300 pieces of contemporary art from rather important names! Sadly, it’s only open Friday and Saturday (and upon appointment) so I didn’t get to go. Make sure to stroll around the town’s many “vicoli” or narrow streets. The most famous and photo-worthy is vicolo Baciadonna (kiss-women), so narrow that two people passing would have to know each other very well. The lovely Lago Trasimeno is the largest in central Italy (though to us North Americans it’s kinda just a pond). When I used to work in Cortona, I enjoyed seeing this lake viewed from the town, but it’s taken having some good friends in Umbria to actually visit it (the darlings Linda and Steve of The Beehive in Rome, who live in Orvieto, and Rebecca who has apartments in Assisi). It’s about an hour and a half’s drive from Florence to a great restaurant on the lake called Rosso di Sera in the town of San Feliciano, where we occasionally meet up with our friends for a long raucous lunch. If you go, get the fish and chips! Last time we were there, we took the ferry across to Isola Polvese, which is a lovely park with a castle (only accessible in spring and summer). On our list still are the other two islands. The small town near our villa is worth mentioning as a quite remote medieval town, with an extensive modern section, that is making an excellent effort to promote glassmaking, an important part of its heritage. They’ve been at it since at least the 15th century, as one learns when visiting its glass museum, which has been created inside the historic glass factory. Just outside of town is a large modern glass factory that employs many of the towns residents today. As I mentioned, once we got to our home managed by Special Umbria, we really didn’t want to leave. 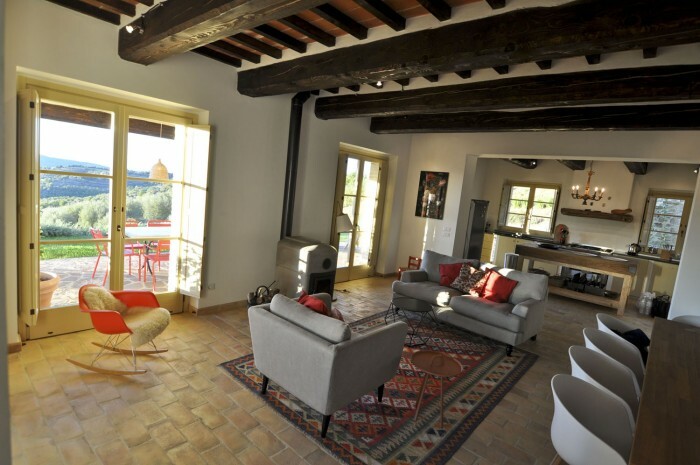 We chose Casa Refogliano, a recently built farmhouse in a small hamlet with a few other homes. Owned by a Dutch family, it’s beautifully decorated with some scandinavian touches. The best thing is its huge main room, with a great big kitchen, large living room and super long social dinner table, wood burning oven and tv nook. 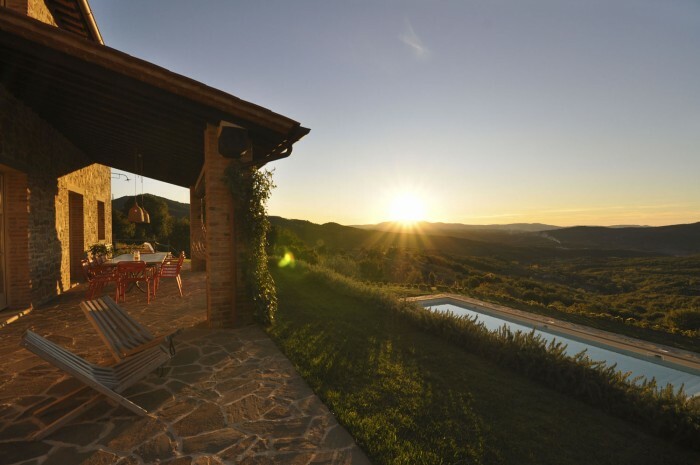 Or maybe the best thing is the outside, with a swimming pool (we’re here in October, so we can only imagine how nice that would be in the Summer), pizza oven, BBQ (which we did use), and awesome dining table on the back terrace, which has an amazing view across Umbria. You can even see Lago Trasimeno! My parents, husband and I had plenty of space with its 4 bedrooms and uncountable bathrooms. I just love this bathroom. I swear I didn’t even retouch this photo, that’s how much light comes in through its two windows! This is a super location to rent if you’re two couples with kids, or a group of friends. In a week here, you’d drink a lot of wine, relax, and occasionally hop out to visit some of the small towns I mention here. If you’re feeling like traveling more, I also suggest visiting Cortona, Assisi and Perugia. Disclaimer: I was graciously hosted by Special Umbria in exchange for writing an article about what to do in Umbria. All opinions and experiences are my own.